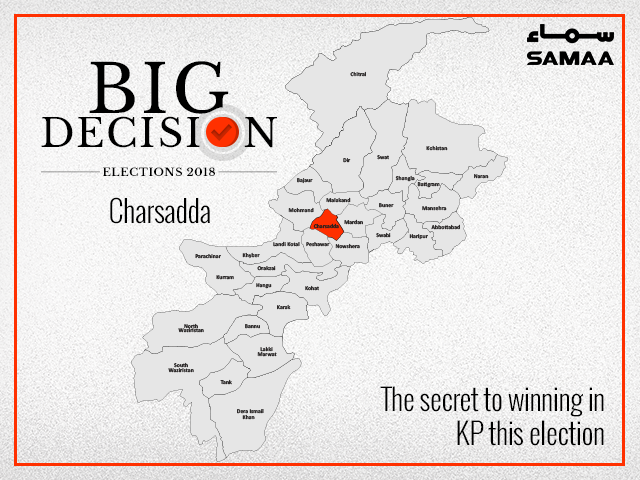 In KP, Charsadda is a hot political potato as nearly all parties pour their money into winning here and in Swabi after Peshawar. Overall, the PTI has been trying to take on the ANP and QWP here. The QWP feels very secure here but it should watch out for the PTI that will take advantage of the ANP-QWP rivalry. PTI’s Anwar Taj and MMA’s Zafar Ali Khan. Sherpao has rarely lost. On NA-24, ANP’s Asfandyar Wali is up against PTI’s Fazal Muhammad and MMA’s Gohar Shah. Gohar Shah defeated Asfandyar in the last election and is still considered a favourite but unlike last time Asfandyar has been actively campaigning. From PK-56, QWP’s Sikander Hayat Khan is up against PTI’s Khalid Khan and MMA’s Gohar Ali Shah. In PK-57, QWP’s Arshad Ali, ANP’s Shakeel Bashir Khan and PTI’s Aziz Ullah are in the arena but the actual competition is between the QWP and ANP and it’s hard to tell who has better chances. From PK-58, Asfandyar Wali’s Aimal is up on the ANP despite a fair bit of controversy. Ihsan Ullah Khan from the MMA and Sultan Khan from the PTI are going to try to thwart the ANP. The actual fight is between Aimal and Ihsan. In PK-59, Fazal Shakoor from the PTI against ANP’s Qasim Ali are up. But QWP’s Hashim Khan and MMA’s Abdur Rauf are likely to give these two parties a tough time. In PK-60, MMA’s Musamir Shah and PTI’s M. Arif are strong names and ANP’s Mairaj Uddin and QWP’s Babar Ali are eyeing the floating or undecided voters.